This is what unethical sales in the merchant account world looks like. I’ve crossed out the business information, but Mr. Michael Lendon is pretending to be this company’s merchant service provider which he is not. That’s very unlikely a real person as I’ve found at least another public example of the same deceptive marketing on the internet. These fraudulent marketing forms might seem benign but can have disastrous consequences for businesses that fall for them. Many times a business is subject to termination fees and even being sent to collection because they end up switching companies and their old account was never closed. But, more importantly they are now trusting the money and possibly the very existence of their business with a company that flat out committed fraud to obtain their business. Management has finally approved you a lower rate of 0 .98°/o due to your consistent sales volume on Visa, MasterCard and due to being a lower risk merchant with minimal chargebacks. You are currently overpaying on your merchant blll every month under the original program. Please complete form below today before Visa and Mastercard Increases their rate so we can LOCK It for you at the lower rate. This low rate program is for customer retention purposes which you qualify for as a low risk merchant, and as long as you stay with the program you will continue to receive the benefits of lower rate savings. 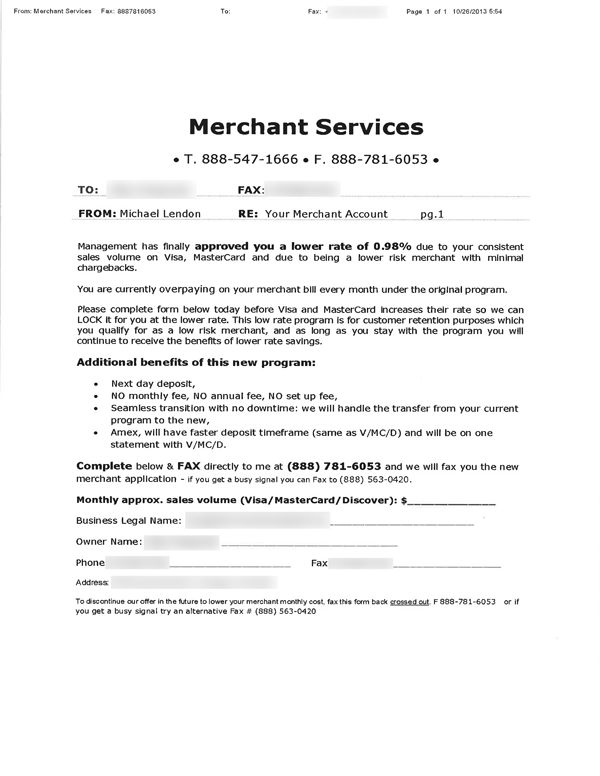 merchant application – if you get a busy signal you can Fax to (888) 563-0420 . I work at a small fax broadcast company and the number of scam clients trying to sign up every week is on the rise. We only work with honest companies who have an established business relationship with their fax recipients. So no matter what the nature of the fax you receive, if you don’t recognize the sender be very careful.